Posted on Mon, Mar 26, 2012 : 5:57 a.m.
From left, Pittsfield Township police Officer Kevin Cassette, fire Capt. Craig Liggett, police Officer Matt Hornbeck and fire Lt. Dave Dorian. A new fundraiser for families affected by autism has special meaning for two Pittsfield Township public safety officers. 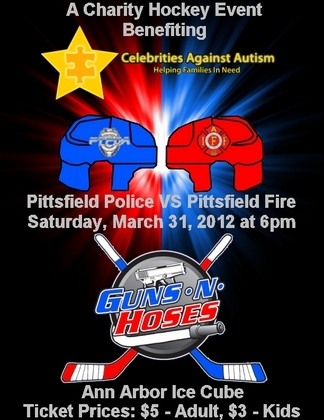 The Pittsfield fire and police departments are squaring off Saturday, March 31, in a charity hockey event benefiting Celebrities Against Autism. The idea for the event, dubbed Guns-n-Hoses, came through Lt. Jason Sperle, an Ypsilanti resident who has worked in the Pittsfield Fire Department for 12 years. His 3-year-old daughter was diagnosed with autism last year. He was approached by Celebrities Against Autism about doing a fundraiser with the fire department after participating in one of the charity’s bowling benefits last October. “Normally they do a fill-the-boot campaign, but we wanted to do something more,” said Sperle. He called on fellow firefighter and hockey enthusiast Dave Dorian, who contacted the police department about putting it together. Celebrities Against Autism provides grants to Michigan families to fund autism therapy, such as speech sessions, which Sperle says cost $200 an hour at minimum. Pittsfield police Officer Kevin Cassette, who has been on the force for 15 years, has a 13-year old daughter with autism. “Back when she got diagnosed at 3 (years old) there weren’t a whole lot of support groups going on. It seems like now there are more organizations and outreach that can help kids and parents,” Cassette said. His wife, Mary, wrote a children’s book on autism called “My Sister Katie” and just started the blog Adventures in Autism to share her personal triumphs and challenges raising a child with autism. “We know what we went through and we just try to help anyone who has this,” said Cassette. 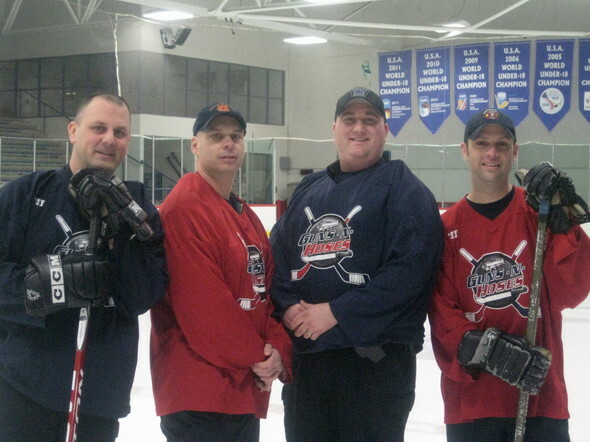 The teams for the hockey game are made up of 29 police and firefighters, including officers from Chelsea and Saline. A University of Michigan police officer and Ann Arbor firefighter have agreed to referee. The event will take place at 6 p.m. Saturday, March 31 at the Ann Arbor Ice Cube. Tickets are available at the door for $5 adult and $3 kids. The Ice Cube donated ice time, and Perani’s Hockey World located inside the Ice Cube gave them a deal on jerseys. Miss Michigan will be on site to drop the puck and pose with any girls who want to try on her sash and crown. There also will be a 50/50 raffle, silent auction and other games. Dorian, a firefighter with Pittsfield fire department, says they have done a lot of charity events in the past but nothing of this scale before. “We’re all touched by (autism) somehow—whether it’s a daughter, cousin or close friend with a child that has autism.” Members from the police and fire departments agree they have had a lot of fun planning the event. Tue, Mar 27, 2012 : 12:26 a.m.
Wow - not only do they risk their lives, but they do stuff like this. This is an amazing story - thanks for posting it. I will definitely be there with my family. Thanks for everything you do! Mon, Mar 26, 2012 : 12:03 p.m.
Nice to see stories like this , but wish we didn't need them. Mon, Mar 26, 2012 : 11:49 a.m.